My daughters have come up with a new name for this mushroom spinach quiche. They call it their healthy breakfast pie. No matter what you decide to call it, I assure you it will have you smiling. 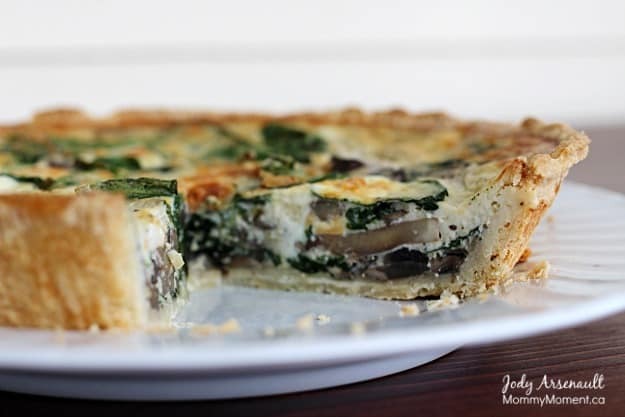 This quiche is packed full of vegetables and with the Silk almond milk and fresh spinach, it is a great way to get your day started off right. A healthy breakfast has everyone feeling better. You may use a 9-inch pre-made crust or make your own using the ingredients below. Prepare bought crust as it says on the package or make your own using these instructions. In a medium bowl, mix the dry crust ingredients. Stir in the oil and Silk almond milk. Keep stirring until the mixture sticks together and forms a ball. Press the dough evenly onto bottom and sides of a deep, 9-inch pie pan. If it is too sticky add a bit of flour to your hands for this step. Bake for 10 minutes. Cool. While the crust is in the oven you can prepare the filling. Heat the extra virgin olive oil in a large pan over medium heat. Add in the mushrooms and sauté until they begin to brown, about 8 minutes. Add 1 1/2 cups of spinach and continue to stir until the spinach wilts. 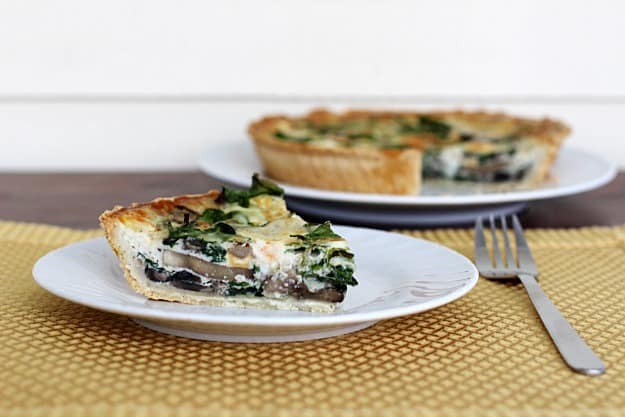 Next you will pour the mushrooms and spinach into prepared crust and top with remaining 1/2 cup of fresh spinach leaves. In a different bowl, whisk together the remaining ingredients (eggs, Silk salt, pepper and nutmeg) and then pour that egg mixture over mushrooms and spinach that are in the pie crust. Bake in preheated oven for 40-50 minutes until set. Cool for 10-15 minutes and serve. Please do not limit this to breakfast either. Quiche makes a great lunch-time meal or a light supper. This recipe is a favourite for our family and I love that it easily incorporates healthy ingredients for a healthy lifestyle. Enjoy! You may also like this Creamy Asian Slaw recipe that uses Silk Unsweetened almond beverage. Disclosure: This post was brought to you by Silk via Glam Media Canada. The opinions expressed herein are those of the author and are not indicative of the opinions or positions of Silk. I have never tried a mushroom quiche and look at this picture I see what I’m missing out on…yum! Marina, even my little girls loved this recipe. You’ll have to try it sometime. Oh that sounds really nasty, love spinach and mushrooms! Sounds great for breakfast! With all the eggs my chickens lay, we love quiche and frittatas. This recipe looks amazing, and we will be trying it! Thanks! That looks delicious! Great meatless monday recipe! This looks really good!! I don’t make quiche that often. No one in my family likes mushrooms, but this looks like a good recipe that i can sub in our favourite veggies! I love quiche but have never tried this combination. I Love the presentation too! This looks great. I just recently started putting spinach in pretty much everything, now i got something new to try. I love all kinds of quiche and this one sounds very healthy! Definitely one to try! Thanks for sharing, Jody! I just picked up some Silk and was looking for new ways to use it. This recipe is perfect and I am excited to try it! Sounds good! I would love to try this for dinner and possible make the mushrooms a bit smaller. Other than that, I am curious to try the nutmeg. I love quiche but never tried making it with Almond milk. Looks like it turns out great! I love quiche and I love the choice of ingredients used in this one.It looks and sounds sublime.Thanks for posting it. Mmmm, I love quiches! So great! Looks very yummy, will definitely will have to try this out for breakfast one of these days. Thanks for sharing this recipe! I actually have everything I need to make this! Father’s Day brunch coming up! I love quiche and I love mushrooms, but I have never tried a mushroom quiche before. Will have to give this recipe a try. Never thought of using the almond Silk milk in a quiche. Sounds tasty. I love mushrooms but I have not tried a quiche yet. I will try out your recipe! Thanks for posting this, it looks delicious! I LOVE mushrooms, and spinach is pretty good too, so I know I am going to love this recipe! This quiche is now added to my list…it’s packed with nutrition! I am always looking for new ideas to make my family something different for breakfast and this recipe looks delicious.